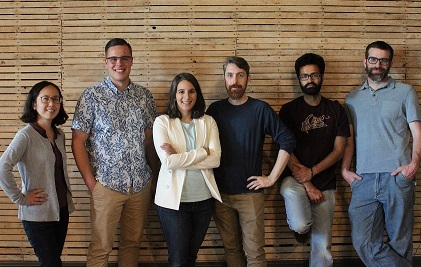 The SomaDetect team with Founders Bethany Deshpande and Nicholas Clermont in the centre. Fredericton-based SomaDetect, an agricultural data company that analyzes cow’s milk to moniter health and increase milk quality, has been growing fast and is showing no signs of slowing down. The company has announced that it is expanding its offices to Buffalo and adding three new executives who have a combined 50 years of experience in product management, leadership and commercialization. John Gavigan, Daniel Fuglewicz and Margaret Kerr will serve as the Chief Operating Officer, Director of Embedded Engineering and Office Manager/Executive Assistant to the CEO, respectively. The Buffalo offices are well positioned for SomaDetect, which develops hardware and software for dairy farmers. Its technology scans raw milk with a laser beam, scanning the fat content and somatic cell count as each cow is milked. This provides data that can point to the presence of mastitis, an udder disease, as well as measure the quality of the milk. “There are more cows in the state of New York than all of Canada,” said Ryan Cobb, SomaDetect's Customer Success Specialist during an interview. On top of growing its staff, SomaDetect is set to join two programs, the 2018 Sprint Accelerator Cohort and the NVIDIA Inception program. NVIDIA aims to nurture startups that are disrupting industries with AI and data. What’s also exciting for the company is the Sprint accelerator’s corporate sponsor, the Dairy Farmers of America. The three-month accelerator in Kansas City, Mo., positions SomaDetect to collaborate with one of the largest dairy companies in the world, with more than 13,000 farmers in 48 states. SomaDetect was founded by Deshpande, Bharath Sudarsan, and Nicholas Clermont in 2016. Since then, SomaDetect has been a finalist in the NBIF Breakthru Competition, the winner of the Fierce Founders Bootcamp in Ontario and winner of the Ag Innovation Showcase in St. Louis. It also won $1 million at the 2017 43North competition, in Buffalo, which allowed the company to facilitate its U.S. expansion.